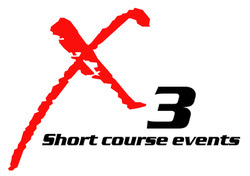 X3 events are family friendly welcoming parents to be a part of their child's growth in golf. All events are played on executive par 3 and short courses. Events are for Boys and Girls ages 5-14. Parent caddies (18 or older) or rules committee approved. Each event is 9 holes making it a great fast experience. Our events are rules "lite" waiving approximately 10 Rules of Golf as we want kids to learn how to play and not be stressed about rules of play. See X3 Rules of Play for more information. X-Factor - Division for all ages 5-18. Players may declare to play in this division at anytime during a tour. Points earned from the regular division are forfeited. You may not elect to play back in the regular divisions once you have declared. All play is governed by the Rules of Golf with the exception of 9 stroke maximum and no disqualification. All play is from the Black tees. There is a separate Boys and Girls for the X-Factor division. Kids tournament golf begins here!